I love marigolds! Everyone appreciates these sunny summertime annuals that repel garden pests. Who knew they had so much of Mother Nature’s healing powers, also? Well, probably ancient sages and hedge witches and herbalists down through the ages! Marigolds, known as calendula to herbalists, can be used to make an excellent skin healing cream. Calendula infused oil is a main ingredient in my skin healing salve. This is my ‘go to’ for insect bites, stings, rashes, and burns. Not only does calendula heal, it relieves pain and reduces the risk of scarring. When using the herb itself, an infusion or tea can be used to heal painful gums, mouth sores and ulcers. This same infusion can be used as a facial rinse for those with acne. Again, it reduces scarring…this is good news for teens looking for a less chemically induced healing of acne. Drink calendula tea for breaking up mucus in upper respiratory infections. Use calendula tincture, made with alcohol, not glycerin, as ear drops for ear infection. It will help relieve pain and heal the infection. This lovely summer flower makes a great addition to any herbal medicine chest! 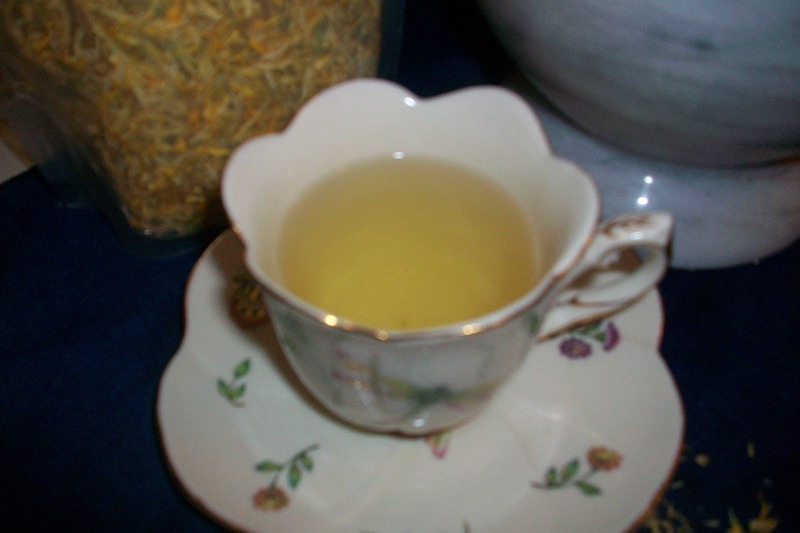 Click here for your quality organic calendula and other herbal teas.